Since World War II ended, the dramatic increase in the American middle class has been a historical trend that transformed our society. Owning a home and a good car or two, never missing a meal from want, being able to vacation and send your kids to college, and then retire comfortably has become the American Dream and was just assumed to be easily achievable by many of us growing up. A New York Times report recently showed evidence that more and more Americans are unable to achieve that level of success in life. For U.S. Senator Jeff Sessions (R) from Alabama immigration is identified as the cause for more and more Americans becoming trapped in poverty, stuck in low wage jobs (if they are lucky enough to have a job at all), and increasingly dependent on government handouts like extended unemployment benefits, disability payments, food stamps, Medicaid, and Obamacare subsidies for their needs. Sen. Sessions has opposed an immigration reform package that is before the House that passed the Senate last year. The legislation would grant a path to citizenship for an estimated 12 million illegal aliens already in the United States and would open legal immigration to an estimated one million new immigrants per year. Sen. Sessions has argued that there is not enough new job growth in this country post-recession to create jobs for our own natural population growth….much less to provide jobs for millions of new immigrants many of whom will be eligible for various government assistance programs from public schools, to food stamps (rebranded as the SNAP program), to Obamacare insurance subsidies, to Medicaid. Immigrant groups and business groups including the U.S. Chamber of Commerce are lobbying House Republicans to pass immigration reform this year. 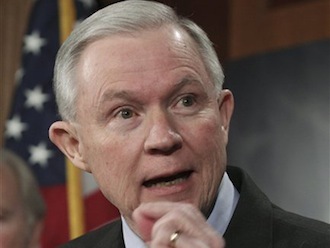 Senator Jefferson “Jeff” Beauregard Sessions III will face the Alabama voters in this year’s election as he seeks a fourth term in the U.S. Senate, but at this point he does not have an opponent (Republican or Democrat).